I need to add lots more races, expand my information about my domains, fix my Wealth system, etc. So look for the addition of racial templates, lots of NPCs and more odds and ends as the fantasy store gets some much needed attention. I may even have to wake Randal from his nap. And why not, I am the boss here. Enjoy your nap, my man! I always liked Chain Devils. Thought they had a cool look. Reminds me of my 7th grade math teacher, and sadly, I'm not exaggerating much. Disability: Gnaw Demons are slow and clumsy, only able to move 15 ft per round when not flying. Build Comments: So I changed my mind and decided to finish my demon run since I had everything build for the early part of my game. These are some nasty little buggers from the MM2 that I had to bring into my setting. 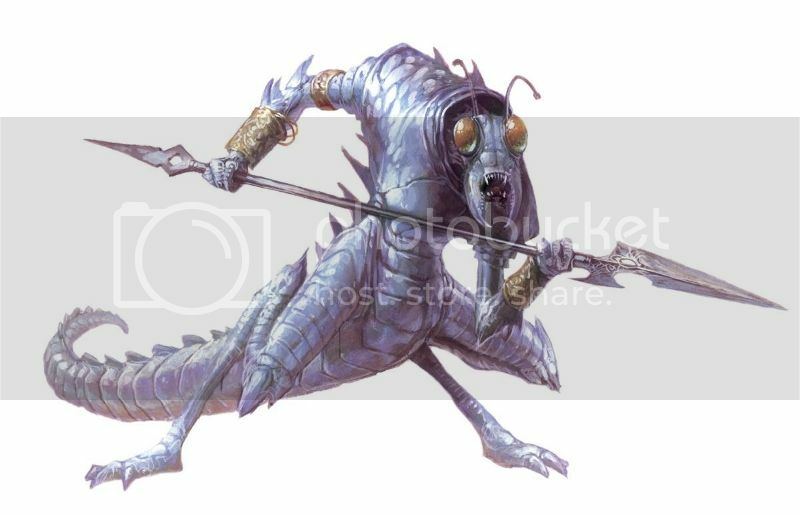 Gnaw demons are little, ugly, squat things that float around the periphery of battles until someone gets pretty hurt, then they pop in and try to get a quick meal. I had fun converting their powers over to MnM and I like the way they came out. Responsibility: To their demon lord and/or their commander. Build Comments: These are the shock troops of the Abyss, the Legion Demons. They exist only to fight and destroy the foes of the Demon Lords, obeying orders without question. A handful of them are no problem for higher level characters, but generally they come in hordes. Here's some Mass Combat for them. Build Comments: These guys are a step up from the standard Legion Demons. They’re more experienced and thusly more accurate and harder to hit than the grunts. Build Comments: These are the field generals of Hell’s armies, the Elite. They are badasses and generally are not minions, unlike the Veterans and grunts. Power Loss: Ice Demons must wait one (11-20), or two (1-10) rounds before using their Freezing Breath again. 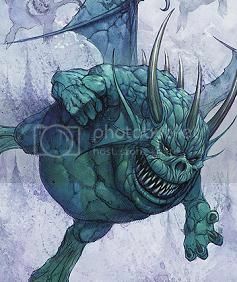 Build Comments: Ice Demons are nasty little buggers, with their Freezing Breath and Icy Longspear. Now that is a lot of bull. Build Comments: Loves Goristros. Huge, minotaur-like demonic engines of destruction. 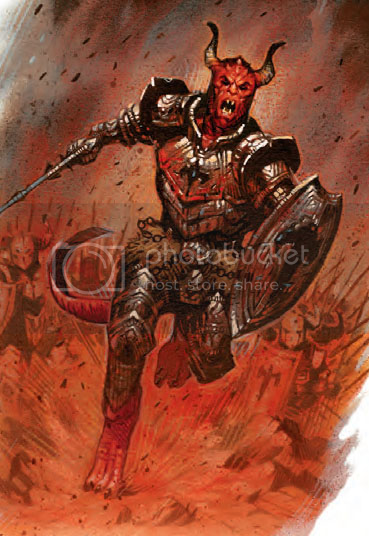 A fine challenge to throw at your heroes to set them up to face an even higher level demon, which is frightening in that your heroes should be good and beat up after dealing with this (or "these" if you’re particularly hateful as a GM, which I totally respect ) brute(s). Motivation: Mariliths are driven by their love of martial combat and will seek just about any opportunity to prove themselves. Build Comments: The Mariliths were never favorites of mine until recently but they grew on me. And NOW I'm done with demons for the moment. I'll come back to them later for different types and the Demon Lords. Disability: Hellhounds cannot speak to humans or use their paws to easily manipulate objects. Vulnerable Hellhounds are vulnerable to cold and holy based effects, taking an extra degree of damage/effect with a failure. 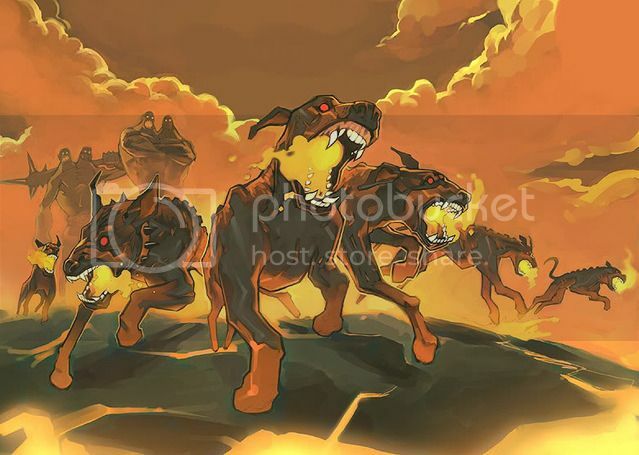 Comments: Hellhounds are not technically demons in my setting but they are denizens of the hells. They, like Hellcats, Hellbats and other hellish animals are in a different category. But they still have a lot of the demonic abilities, they're just not truly sentient, which is the cutoff for me to be considered a true demon. What're you lookin' at, bub?!?!?! 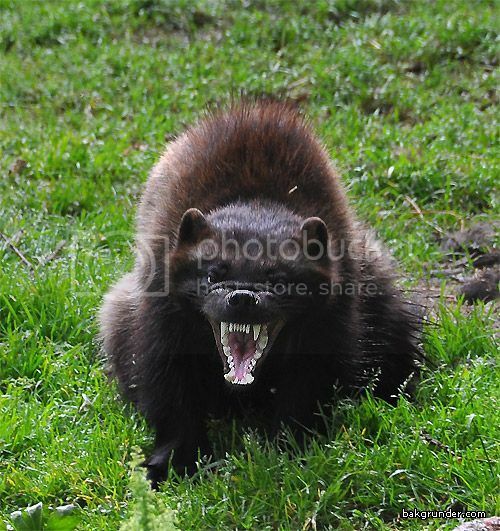 Disability: Wolverines cannot speak humanoid languages, nor use their paws to easily manipulate objects. Comments: Wolverines are cool creatures and of course, they were the inspiration for one of the most popular superheroes of all time. 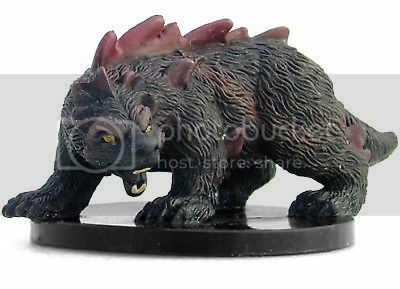 They are legendary for their fury, taking down creatures many times their size, including, if the stories are true, bears. I mainly built the regular wolverines so I could build the Dire Wolverines coming up next. But a wolverine could still be something fun to throw at a low level party to keep them on their toes. Yeah, what're you lookin' at, bub?!?!?! Comments: Dire Wolverines are wicked. I made them really tough PL7’s that are not to be messed with by lower level parties. Dire wolverines tend to be even more territorial than their smaller wolverine cousins, and they defend to the death the areas where they choose to live, often selecting humanoid-settled regions as their own and then fearlessly tearing the settlements apart. Dire wolverines grow to about 12 feet in length and can weigh as much as 2,000 pounds. Enemy: Any enemy of the crown of Gilthorian but Lord Creed in particular. Reputation: Loghahn is one of the most feared of the X-Knights. Responsibility: To the crown of Gilthorian and his fellow X-Knights. Comments: I really need to put some more thought into his background, but I was so into this build and idea, I had to get this posted. 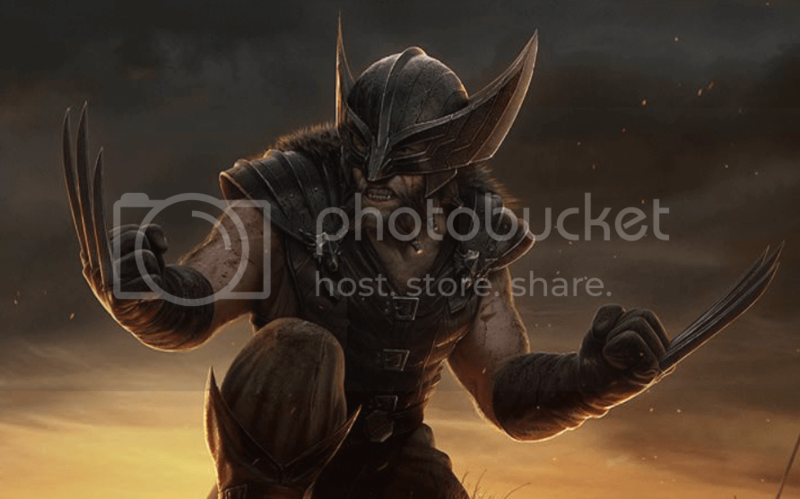 I was looking for some art of the actual wolverine/dire wolverine builds I was working up to post and there it was: fan art of Logan in medieval garb. Then I knew I HAD to work him up for my setting. More research uncovered lots of superheroes in medieval outfits and it hit me: King Xander Daellion’s X-Knights should be sword and sorcery versions of my favorite superheroes. So I’ll be dropping fantasy versions of the some the big Marvel and DC characters as the muse strikes me. Loghahn here obviously has a rage issue, but he’s fanatically loyal to the crown and one of the most dangerous members of the X-Knights. With the healing factor he was blessed with and his berserker rage, he’s been know to fight way above his weight class, taking down adult dragons and other epic beasts as well as mowing through whole armies practically single-handedly. Conflicted: While he loves being with his family and generally enjoys fulfilling his duties as King, he greatly misses his adventuring life. Doing Good: Xander is driven by a strong need to do good and protect those that cannot protect themselves. 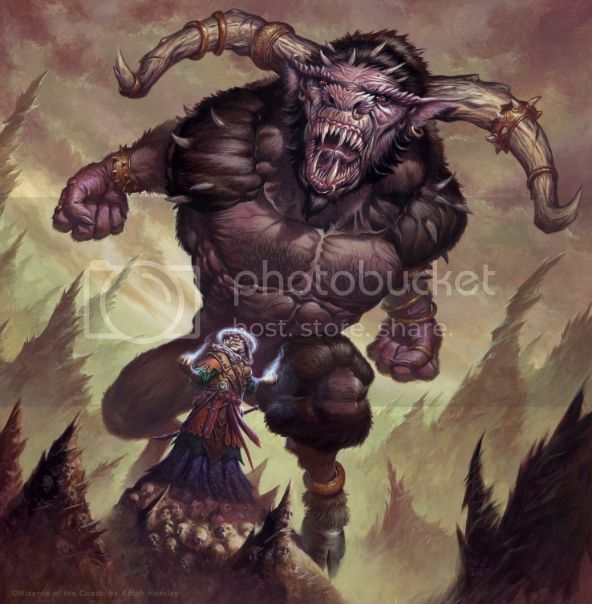 Enemy: Demogorgon and he have a history and the Demon Prince wants payback. for a prior defeat. And there are several former enemies from his adventuring days that seek revenge against him and his family. Honor: King Daellion is a true man of his word, and he holds to it no matter what the cost. Phobia: Even though he can swim a little bit now, he still is very afraid of the water. Relationships: His family, including his 9 siblings, with him being closest to Sian, Pergathon and Balderron;, his mother, Berises, his father Malchior; his wife Diiva, and his children, sons, Jaxx and Jacade and his daughters, Tishana, Arisema, Alispeth, and Danea. Responsibility: As the High King of Gloriant, his responsibilities to the realm are numerous. 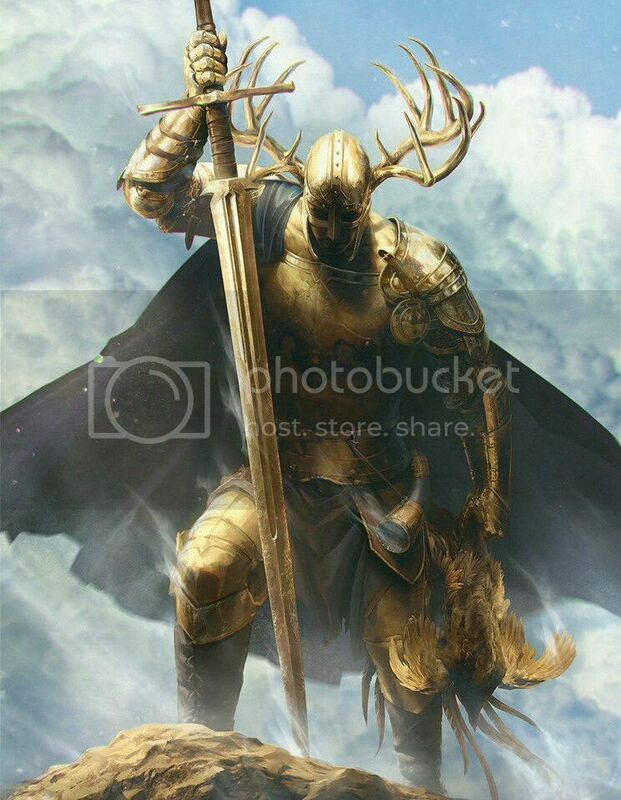 This is Xander 25 years after he helped bring about the Third Age of Gloriant, where he is the High King of the known lands. While most of the other domains have some sort of monarchy, he is consider the High King of all of the land. Most respect his power and legacy as the slayer of the evil Montarrio and he and his X Knights have worked diligently to maintain peace with all the nations, at least as much as they can. It doesn’t hurt that as far as most everyone knows, he’s the most powerful non-dragon, non-demonlord or non-god being on the planet. As far as his stats go, they are generally based on where my original character ended up but I did make a few enhancements from where he was when I moved on. He had all 25’s for stats thanks to a Wish spell (that for once, my old DM did not tack on a twist) so that would relate to all 7’s in MnM. And he was given the Star Sapphire Sword, an epic weapon that was +3 to hit, +5 to damage in 1st edition D&D, making it an EPIC weapon for that original edition. It was an original creation of Willard’s, and it could do a lot more than I listed, but alas, I only remember those abilities and the sheet is long gone by now. Willard made “Three Swords of Power” in his setting, another was the Blackfire Sword and third one I cannot remember either, but I will come up with something. I’d like to make that part of an epic level campaign sometime. The funny thing is that he gave it to me at like 6th level, so I quickly became the party’s big hitter, but Willard was great about not letting me get too big of a head by throwing me into crappy situations all the time. He also let us keep scales from the first red dragon we killed, so I had a shield made from one, which I carried. Of course, it got us attacked by more red dragons, but it was worth it. I cannot remember what level he ended at but it was in the 20’s overall. I stopped taking Fighter levels after 15 and I took some magic user and cleric levels, so I need to add some spells but I’m just stopping at cantrips for now. Xander was my first RPG creation so I couldn’t let his legend die without some of sort of tribute. And yes, if I ever get this made into a movie, Idris Elba is playing him. 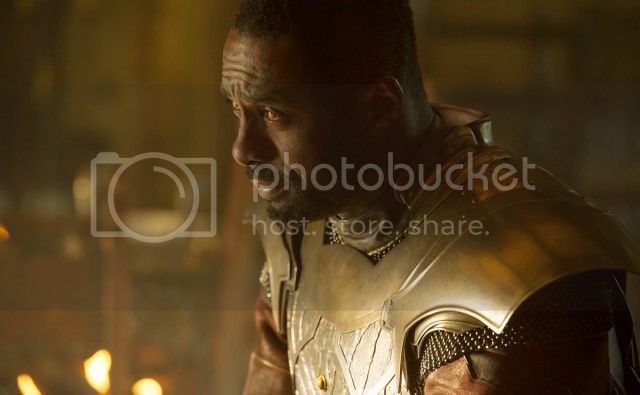 In my revised Gloriant continuity, he, Pergathon and Balderron were taken in as infants by Malchior and Berises Daellion, in the small Gilthorian thorp of Gerenny. There were 11 siblings altogether, 4 other adopted siblings, and 4 biological children, including the oldest daughter, Sian. 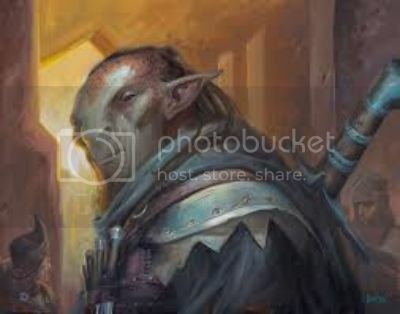 Xander, Pergathon and Balderron were the only non-Gilthorian human children, with Xander having Zagandan origins, Balderron being a half-orc and Pergathon was a halfling. The Daellions didn’t treat them any differently and loved them all the same, but several of the townsfolk did not like the three of them, especially the town bullies, The Bonehill brothers. The 3 Bonehill Boys and “The 3 Odd F*cks”, as the Bonehills called them, had several run-ins over the years. Xander also became good friends with a girl named Mairada, who was also considered an outsider by several of the townsfolk because she had a gift for magic. Outside of that, the boys grew up like most anyone else in Gerenny, learning the values of hard work, family but dreaming of being something more. As time went on, Xander grew into a good-sized boy and due to his many pre-teen fights with the Bonehills and his hours of farm work, by the time he was 13, he had gotten to the point where few people would dare to mess with him. Even The Bonehills, who were far larger than average themselves, got to the point where they talked a far better game against the Daellion brothers than they fought. He became the protector of his family and when he was about 15, he caught they eye of a former adventurer, Elador the Grey, when he took down all 3 of the Bonehill Boys on his own, barely breaking a sweat. He took Xander under his wing and taught him swordplay and proper martial techniques while telling him stories of his time adventuring and his later time in King Olias’ service. Things went on as they normally did for a couple more years when one day, things changed their fates forever. Balderron went to jail after he accidentally killed one of the Bonehill Boys in self- defense. Knowing he would hang for it because of his reputation and the Bonehill family’s influence, Xander, Mairada and Pergathon, who had become an accomplished thief by this time, decided to break him out. Sian, who was very devout in her faith, overheard their plan and tried to talk them out of it. When she failed at that she decided to assist, just to make sure none of them, or anyone else got hurt. Their plan worked perfectly but just as they were getting ready to spirit Balderron out of town, a band of brigands stormed the thorp. Instead of fleeing, they stayed and fought alongside Sheriff Gane and the local militia and with their help, they eliminated the threat. Knowing that the siblings had freed Balderron, Sheriff Gane told them he had to lock them all up. But also knowing they would have probably lost their town without them, right before he did so, he winked at them, whispered “thank you” and “took off quickly to deal with something”, giving them time to say goodbye to their family and leave town. With that, the 5 of them set off for adventure, soon meeting Kalen the Dwarf and other adventurers along their many travels and the rest is history. 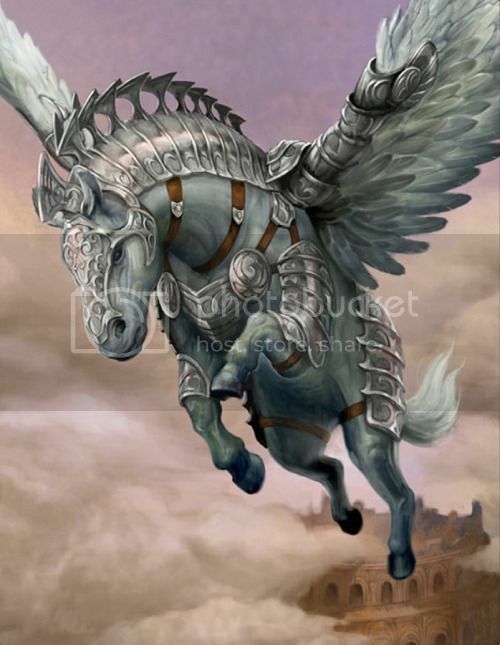 And here is his loyal flying steed, Avagorn. Doing Good: Sian wants nothing more than to rid the world of its evils and to protect its people. Hatred: She loathes all unholy things, but the Cults of Orcus and Demogorgon are her most hated of "abominations". Power Loss: She needs to be able to speak and have her Holy Symbol to perform Rituals and cast her spells. Power Loss: Clerics and Paladins derive their magical abilities through their connection with their deities. 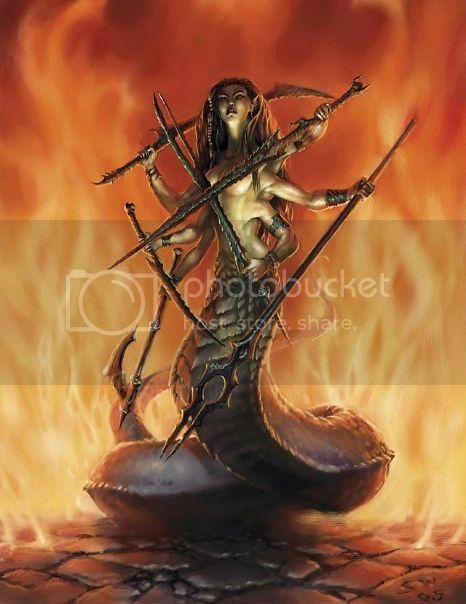 Should that faith be shaken, attempt to call upon too many favors in a short period, should they fail to act in accordance with their deities' will (or whim) or attempt to use their abilities while on the grounds of a rival deity, or one whose powers conflict, they can lose their divine powers. Relationships: She remains loyal to her family, and the members of The X-Emplars as well as her mentor Lady Elsbeth. Responsibility: As the High Priestess of Therin in Gloriant, she has a great responsibility to the church and her station. Comments: Sian the cleric was another of my original characters, my first female character actually. Although I think she started out as a he, but I changed things to make it more interesting for the group since all we had were male characters. In my updated setting, she is the birth daughter of Xander, Pergathon and Balderron’s adopted parents. Pretty, smart and very strong in her faith, some of the other adopted kids (and everyone, really) were jealous of her, but Balderron and Xander kept them in check and she in turn looked out for them when they got into trouble, which was frequent. When the brothers decided to leave, she went with them, despite her parents’ wishes. 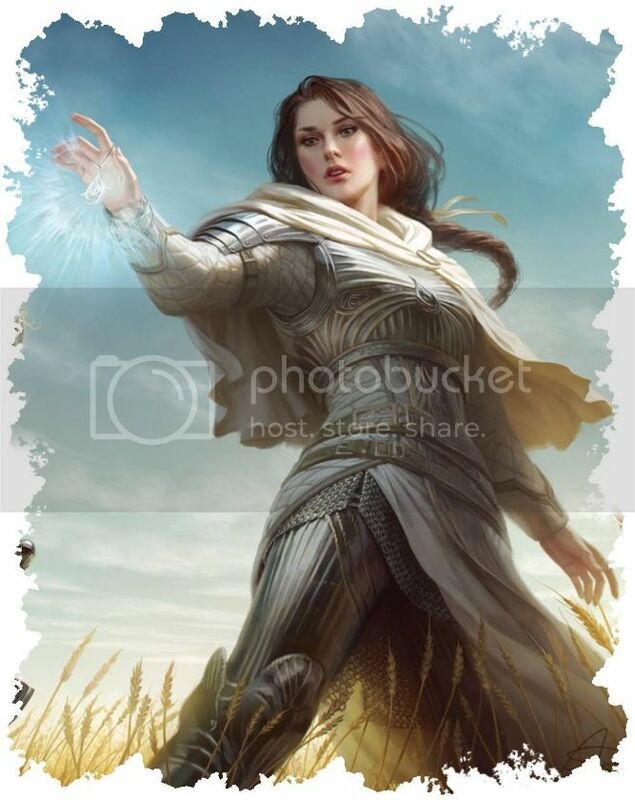 Sian is the High Priestess of Therin in Gilthorian. She’s loyal to her brothers and god, a powerful combatant and the best healer in the land. Comments: Balderron was the core character of my friend, Steve, another of the funniest guys I ever knew. He had a really dark sense of humor that made playing a half-orc assassin perfect for him. I really wish I could get my hands on his old sheet, because I thought Steve did a wonderful job of crafting him to be just the way he wanted him. He was brilliant with poisons and stealth and his sneak attack was brutal, as you would expect. In the new continuity, of the 4 sibs, Balderron is the black sheep. Always in trouble, constantly in fights either because of remarks about his lineage, or taking up for Pergathon or Xander for being hassled about theirs. As such, he had quite the bad rep in their hometown, but the family always stood beside him. King Xander may be the most powerful man in Gilthorian, but no one is more feared than Balderron. After years of adventuring and dedication to his craft, he can kill just about anyone, anytime, and never get caught. He has done “black ops” work for the kingdom many times and will continue to do so as long as the money is right, and it usually is. He and Xander have a “don’t ask, don’t tell policy” and it’s worked for both of them, even though their opinions about Balderron’s methods have never been of the same mind. Arrogance: He quite sure of himself to the point of often underestimating his opponents. Enemy: Giants, Drow and various other enemies he picked up during his years of adventuring. Greed: He has always been a greedy little dwarf, but as he has gotten older, it has gotten worse to where his primary motivation is getting more precious metals from the mines of Thunderhold. Relationships: Despite some of their differences, he is quite loyal to the members of The X-Emplars. He also dearly loves his sons, Burin, Kolfi and his daughter Bragga and his long-suffering wife Vura. 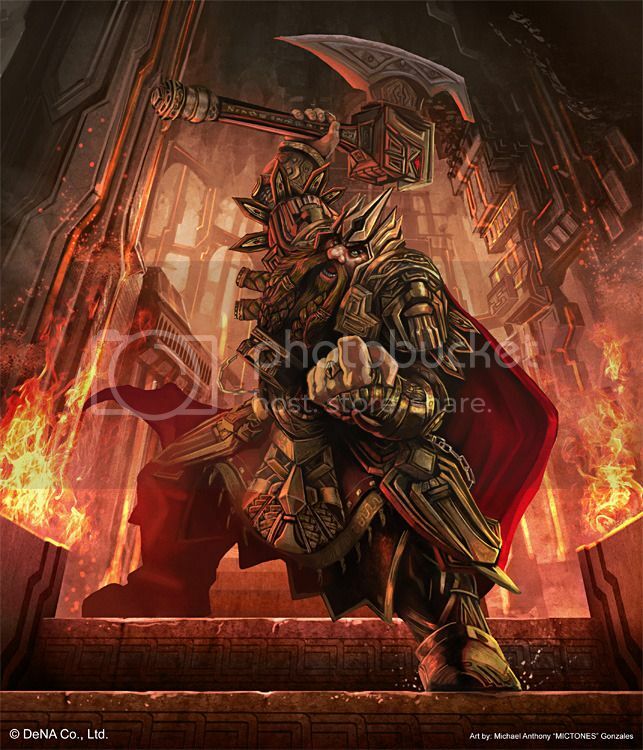 Responsibility: As the reigning king of the dwarven citadel, Thunderhold, he has numerous royal responsibilities. Rivalry: He and Balderron have had a long running rivalry as to who was the better figher. He had one of my favorite lines ever in role-playing but I have to save it until we reach the point in my little campaign (or in the powered up level builds) that it makes sense. I laughed so hard when our DM god-smacked him down for his stupidity, it was just great. This is Kalen where I envisioned him ending up. In original setting, he was one of the princes of the Dwarven realm of Thunderhold so it would seem natural that after his adventuring days were done, he would come back and become their king. He’s still a one-trick pony in combat, but now that he’s running things there, he doesn’t fight much anymore and is far more concerned about the mine(s) continuing to produce and him continuing to gather wealth. He has sworn to King Daellion that should he, or his forces be needed, he will answer the call. But a little persuasion from the Olias Family Vault would certain not be refused.